The Doctor has come a long way since his TV series, Doctor Who, first debuted way back in 1963. Though his face may have changed man times and the show’s special effects may have improved, the adventures remain just as unpredictable as ever. In the opener of series six, four envelopes are received, numbered 2, 3 and 4, each containing a date, time and map reference, unsigned, but in TARDIS blue. Who sent them? And who received the missing number one? This strange summons reunites the Doctor (Matt Smith), Amy (Karen Gillan), Rory (Arthur Darvill) and River Song (Alex Kingston) in the middle of the Utah desert and unveils a terrible secret the Doctor’s friends must never reveal to him. The first part of series six has been on released on DVD and contains all seven episodes as well as Monster files on The Silence and The Gangers. You can purchase Doctor Who: Season Six, Part 1 or you can also try to win a copy here. To enter, you need to merely post a comment below.You can enter once per day. 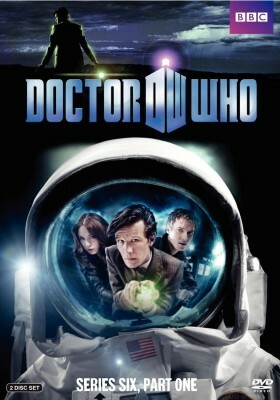 You can also follow us on Twitter and tweet “@tvseriesfinale Hope I win Doctor Who on DVD! https://tvseriesfinale.com/?p=20453“. You can enter once per day. Guidelines: This giveaway is open to participants with a United States mailing address only. (International readers can enter if they have a friend in the States who can accept their prizes by mail.) Many may enter but one person will win. You must be 18 and older to enter and no purchase is necessary. Contest ends August 14, 2011. UPDATE: Congratulations to Isaac who won this DVD set in our contest via a Facebook entry. Thanks to everyone who played and we’ve got more contests coming!